Sue loved teaching! She was one of those teachers that taught because she truly loved children and giving within her community. Osteoarthritis was ruling Sue’s life. At 62 it was difficult for her to get up and down from the floor for circle time, craft time, story time and so much more. She had been forced to retire early from the teaching career she loved because of pain. The day she showed up in my small group yoga therapy class Sue was annoyed at having to leave the house. Her friend had dragged her along hoping yoga would lift her spirits. By then end of class Sue was not convinced but she agreed to do the 12 week session. 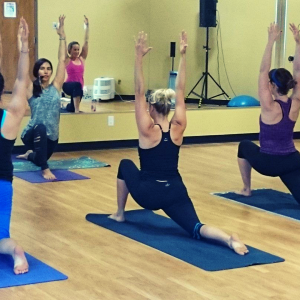 Group yoga therapy sessions are not just a yoga class. When creating the sequences each participant is thought of and their ailments are planned for by a trained therapist. With a focus on facial release and stress reduction, a therapy class combines breath work with both dynamic and static postures. Each movement is well thought out in order to facilitate healing and promote relaxation. Mindfulness is employed to help the practitioner work with their ailments be it mental or physical. Breathing techniques are taught to help calm and sooth the nervous system. At week 10 Sue showed up early to class smiling. “I did up my bra today”! Not what I was expecting to hear! Sue explained how she had been unable to reach her hands behind her back. That normally she had to put her bra around her stomach to do up the clasps in the front then shrug her way into it. A couple weeks back she noticed that she was able to reach her grandchild’s fallen pacifier (under the sofa) without pain. This day she woke without her usual discomfort and thought nothing of getting dressed normally until her husband said “that was fast”. This was not the best part. While I was very happy to hear of Sue’s physical accomplishment the best part came at the beginning of the second session. Sue brought her husband! He told me of her battle with depression since leaving work. How she would spend days in bed, her usual bubbly self, hidden under covers, padded by pillows. Now she was happy! In fact she had started volunteering at the school she had retired from two days a week. Yoga can’t cure osteoarthritis but it can help deliver much needed nutrients to soft tissue and cartilage helping reduce the pain and discomfort. Yoga builds strength while keeping the body limber. Mindfulness based yoga helps people tune-in so that they can work with rather than against limitations set by their ailment. Update: It has been 5 years since I first met Sue. During the school year she is a crossing guard and continues to volunteer with the kindergarteners. During the summer Sue enjoys paddle boarding around the lake at her cottage and hiking with her grandchildren. Offering yoga therapy, celiac counselling/nutrition, mindfulness and meditation services at the Armoury Sports Medicine Clinic in Waterloo, ON. I am listed as “Breathing Therapist” on the booking page. Follow this link to book an appointment with myself, Jennifer Heard PhD, CYT, E-RYT.